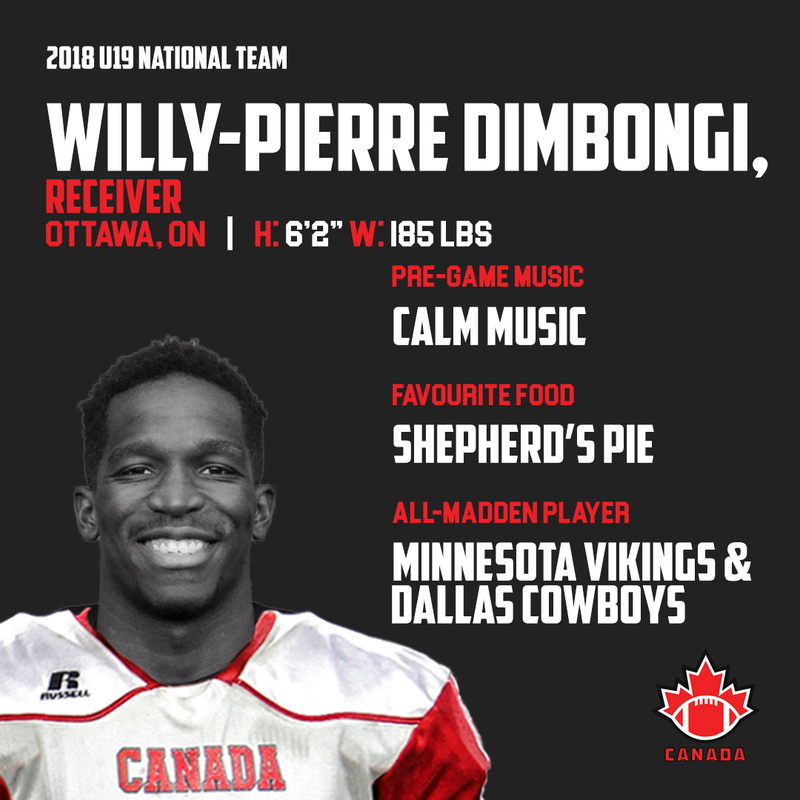 Willy-Pierre Dimbongi is a wide receiver from Ottawa, Ontario who will participate in the 2018 International Bowl in Arlington, Texas as a member of the National Under-19 team. The offensive standout was introduced to the sport by his mother when he was only seven years old. Since that time, Dimbongi has played for the East Ottawa Generals, North Gloucester Giants of the National Capital Amateur Football Association (NCAFA), Cumberland Panthers of NCAFA as well as the Ontario Varsity Football League (OVFL), St. Matthews Tigers of the National Capital Secondary School Athletic Association (NCSSAA) and the Ottawa Sooners of the Ontario Football Conference (OFC). For Dimbongi, his father has been a constant source of encouragement. Another gridiron supporter has been his former high school coach Jean Guillaume. With his selection to the National Under-19 team, it will mark the second time the wide receiver has represented the country and the achievement ranks as the highlight of his career. Ecstatic to have another chance to wear the Canadian jersey, the wide receiver is looking forward to competing at the 2018 International Bowl.